If your much anticipated hiking trip to Peru is cancelled what would you do? 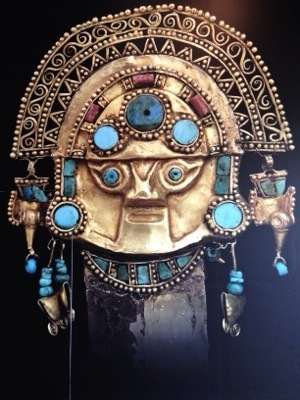 Well, Bestie and I made a road trip to Canberra to gawk at the exotic Inca treasures of the ancient Peruvian civilisation at the National Gallery of Art in Canberra – aptly called ‘Gold and The Incas: Lost World of Peru” (here). 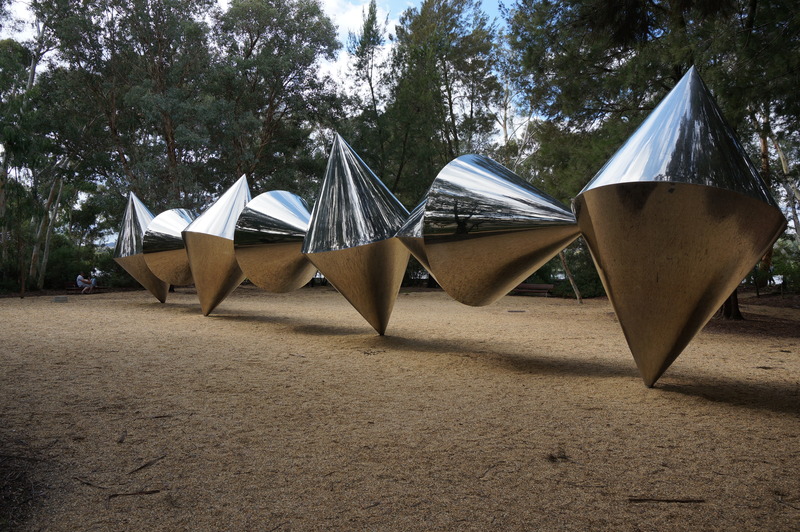 The exhibition is a key component of Canberra’s centenary celebrations in 2013 and also significant in that it marks the 50th anniversary of Australian-Peruvian diplomatic relations, and is organised in co-operation with the Peruvian Ministry of Culture. As such, the works of art are lent by the Museo Nacional de Arqueología, Antropología e Historia del Perú and its fraternal collections, the Fundacion Museo Amano, the Museo Larco and the Museo Oro del Perú – museums that were on our trip’s agenda – as well as the collection of the National Gallery of Australia. Would it surprise you that the Inca Empire lasted only 100 years? This is a very short time for such a vast and famous enterprise! “The Incas conquered all of Peru and much of Chile, Bolivia, Argentina and Ecuador. The state governed from the capital city of Cuzco by a system of duties, taxes and rewards. 20,000km of roads enabled efficient and speedy communication. The Emperor was The Son of The Sun God and the pinnacle of an extremely hierarchical society. The Inca state region demanded scarifices, human and animal – even textiles were burnt as offerings to the Gods. Architecture, e.g. the famous World Heritage Site Machu Picchu, was the glory of the Inca culture (and still is!). Temples, palaces, terraces and fortifications of huge stone blocks were fitted together, mostly without masonry. Sadly, our knowledge of Inca society is filtered through the world view of Spanish chroniclers. The Inca state of at least 12 million people fell very rapidly, due to superior European military technology, civil war and new diseases, especially smallpox. Perhaps 90% of the native population, more than 10 million people, was killed or died of disease and famine after the conquest. Almost every artefact that survives – what we see at the exhibition today – was buried with their owners. As the cult of the dead infers, both noble and common people were interred in different ways according to tiers of importance – from ruling lords, priests, military leaders and retainers – as exemplified by their respective accoutrements and placements in their graves. In summary, this is a well-curated exhibition with over 200 objects showcasing exemplary artefact from each period of the Peruvian civilisation from gold regalia, intricate jewellery and striking vessels to elaborate embroidered and woven cloths. So, don’t miss out! 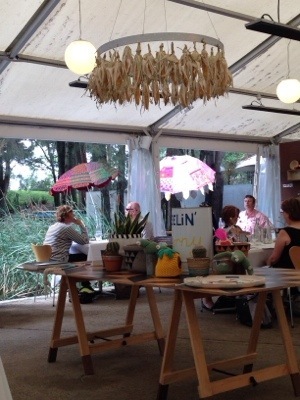 It is only appropriate to round up our excursion by having a Peruvian themed lunch at the Sculptural Garden Restaurant. Finding it needed a bit of detective work as it is located outside the gallery, tucked away to the side of the garden and in a tent by the Marsh Pond. 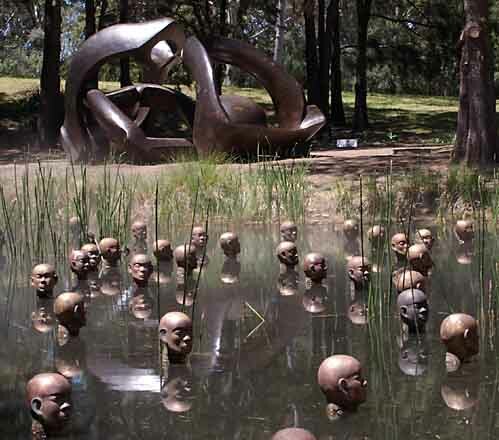 In the Marsh Pond (part of the sculpture garden) is a powerful work by Dadang Christanto, an Indonesian artist based in Darwin. The pond is filled with bronze heads with extra eeriness supported by the mist-maker. His works speaks of victims of oppression and social injustice. If I remember correctly, this piece, “Heads from the north’, is about the genocide in East Timor. 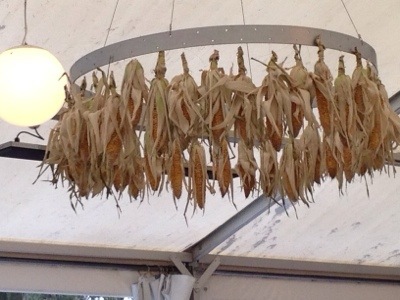 For this special occasion in conjunction with the exhibition, the interior of the restaurant is styled by designer Megan Morton to play up combinations of colour, good times and of course, corn – to accentuate the joy of food and family that the Peruvian culture delights in! Only Set Lunch is served in the restaurant. 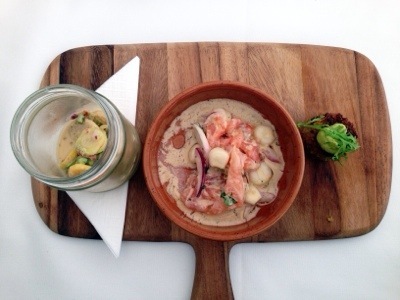 Presented on a wooden paddle pan as is very fashionable now, we have Ceviche of Salmon with Lime, Jumbo White Corn and Coriander. 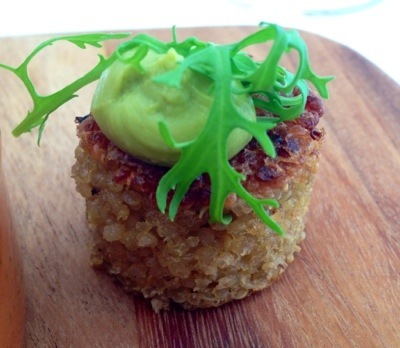 Quinoa: Baked quinoa toped with avocado wasabi cream and a rocket leaf. 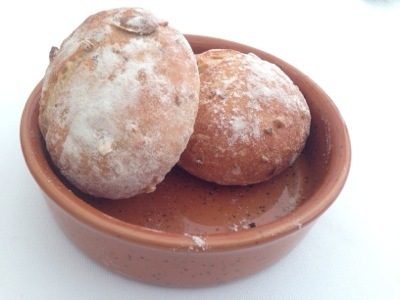 This is bourgeois peasant food! 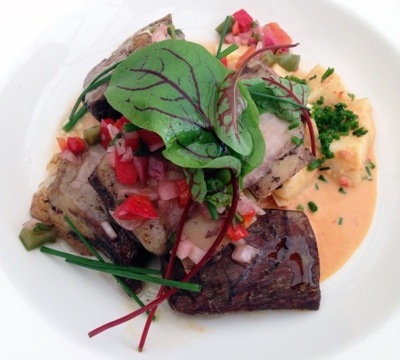 Twice-cooked Beef Short Rib with Chimichurri and Huancaina Potatoes. 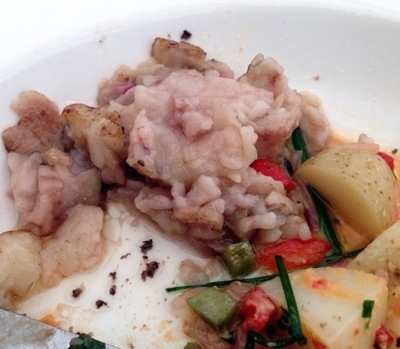 This is a plate of disappointment of sorts: The beef was dry – yet full of fat! The most obvious explanation is that it is not a good cut of meat which has been pre-(over)cooked and reheated thus rendering it very beef-jerky-like in texture. 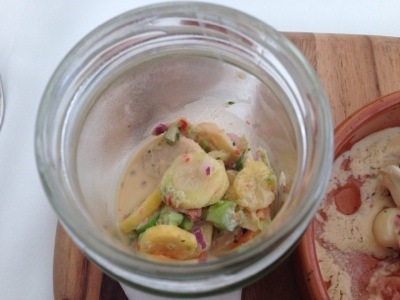 The exotic sounding ‘huancaina’ is basically a spicy cream which is otherwise ‘meh’. Check out my leftover plate of fat! Date of Visit: January 5 2010. 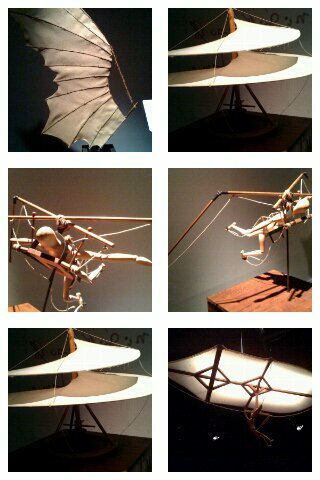 Following my post yesterday on Sultans of Science exhibition in Kuala Lumpur (here), and the current new TV series ‘Da Vinci’s Demons’, I recalled an exhibition on all of Leonardo Da Vinci’s marvellous inventions and works, at Hong Kong Science Museum a few years back. The exhibition had all the replicas of models, books and paintings by Leonardo. 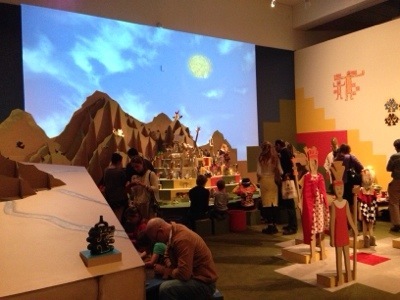 It was a very popular exhibition because the museum was very crowded with people from all ages. Eventhough there were many ‘No Touch!’ signs, but people still touched the exhibits! Urgh! 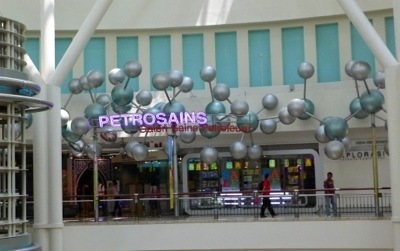 Petrosains Discovery Center is a small discovery museum on the 4th floor of Suria Mall KLCC, this mall is under the famous Petronas Twin Towers. Currently on show is the ‘The Sultans of Science: Islamic Science Rediscovered’ exhibition, a global touring exhibition celebrating the contributions of Muslim scholars in science, mathematics and technology during the Golden Age of the Islamic World (700-1700 CE). There are more than sixty exhibits providing visitors of all ages with a hands-on, interactive and state-of-the-art family-friendly experience with different zones dedicated to Engineering, Medicine, Astronomy, Mathematics, Geography and Agriculture. The aim is to highlight the many ways in which Muslim Civilisation helped lay the foundations for the European Renaissance and has had a profound impact on the modern world. 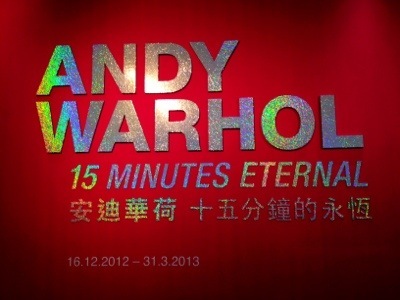 But aren’t we all darling Warhol? And that’s the reason you are (still) accorded with more than your share of 15 minutes fame! 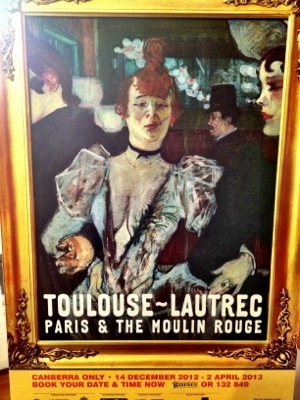 While in Canberra, I took time out to view Henri Toulouse-Lautrec Exhibition at the National Art Gallery. 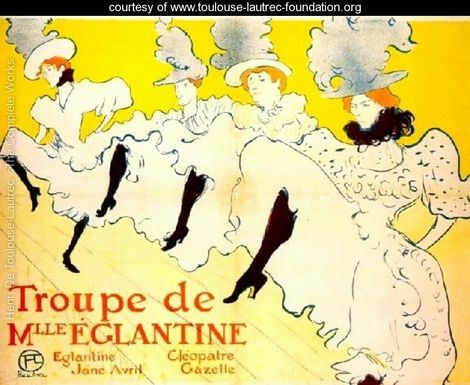 It was a good-call since it was excellently curated from the Master’s early works following the landscapes of Monet, Renoir and Cézanne (in the Impressionist genre) progressing to “La Goulue” of the famed Moulin-Rouge poster. I was especially intrigued by Henri’s caricaturist style of figure drawing which brought to life the characters taken from brothels and seedy clubs in Montmartre and the infamous Moulin Rouge by narrating them in a melancoly of flat colours, marked silhouettes and unusual points of view. The tilted upturned hoinky noses, simple strokes for feet, curvy strokes and empty spaces brought movement and undoubtedly draws the audience into the excitement of his caberet. His broke ground by boldy decking his posters with logos, which pioneered today’s advertising mojo. Before attending the exhibition, I had no idea what he looked like nor for that matter – a DWARF – the result of generations of inbreeding – his maternal and paternal grandmas were sisters! So I guess the sharp pointy upturned noses of his subjects were the result of his perspective from looking up people’s noses. 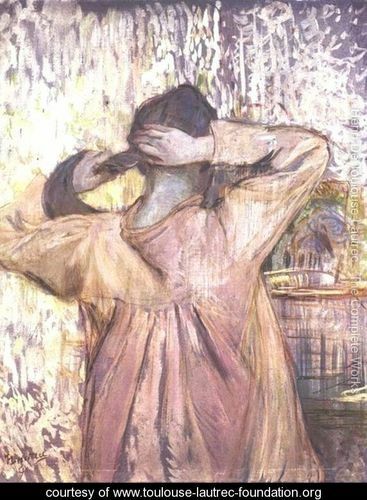 He used simple strokes for his subjects’ feet since his own legs were stunted and child-like. Imagine a man with a full-grown torso with tiny arms and legs! He must have been a very shrewd and self-confident man to be able to poke fun in himself in order to be accepted into the Parisian arts and cultural scene. 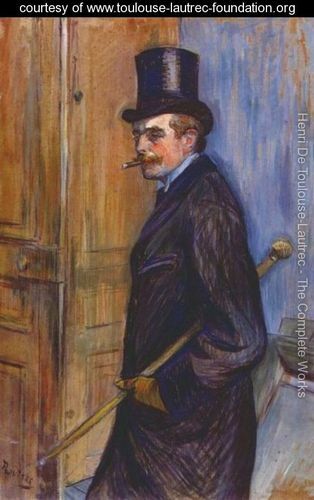 On a closer examination of his companions’ potraits, one can see his sense of humor and his cryptic messages, eg making fun of his man-around-town friend, Louis, below with a phalic-like walking-cane tucked under his arm. Henri is very “Japonaised”. He was strongly influenced by Utamaro and the Japanese ukiyo-e woodprints. Both artists emphasized the new connections between art and everyday life eg lives of the working-class women in brothels and even lived with them. Note the slender neck, swish of hair and state of undress… very Geisha methinks! Also, a bit of goss aside – he has a fetish for redheads! 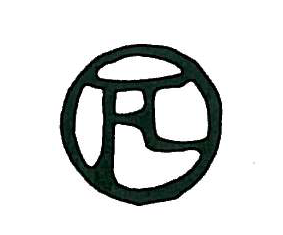 Henri’s monogramed ukiyo-eish signature on his painting, so similar to Asian painters’ seal. 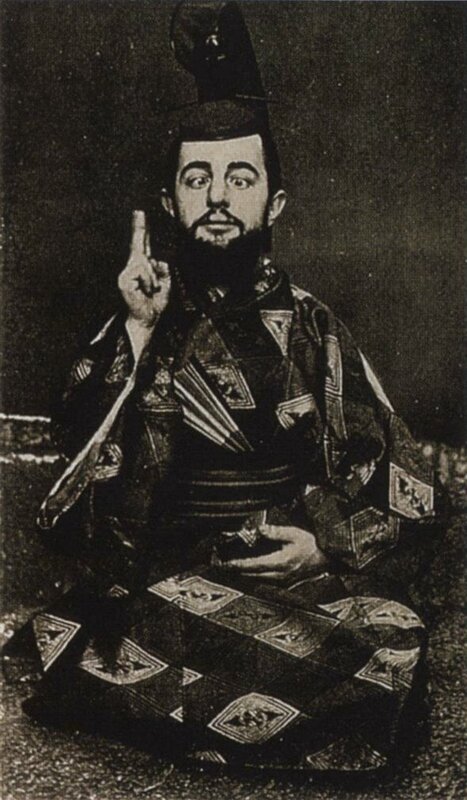 In Henri’s posters, he extrapolated the theme of the Japanese’s graphic linearism, eg the profiles of the top-hat man and the black shadows behind the subject. He also loved splattering, which is sprinkling his painting with diluted washes of paint (you need to sneak up close to the real thing to see it). 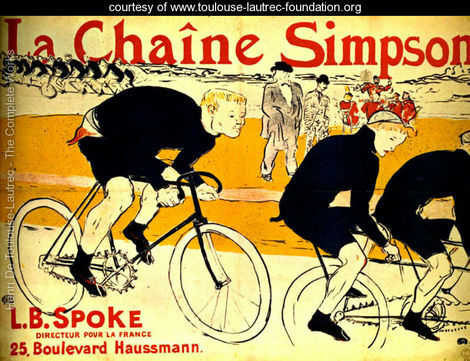 Henri’s posters are art masterpieces and documents of an age – they WIN public’s love. What makes the poster so successful was that poster resonates with the grassroot people, since it is cheap to reproduce (lithography), thus everyone can have a piece of artwork to hang in their house. This explained why his early posters were taken down (aka stolen by his admirers) as soon as they were put up. Hear, hear, Posters = high artwork affordable by the common people. On a personal note, he was estanged from his father because he was a commercial artist – which was a ‘no-no’ in aristocracy. Fortunately, they reconciled shortly before his death aged 36 because he father came to realised that he was making oodles of money! Similar to contemporary rockstars, an artist needs a promoter, and his promoter was his mom. She built him a museum after his death so his legacy lives on. Viva Mama! Japan Uki-yoe museum has the largest collection of Ukiyo-e collection in Japan, unfortunately the web is in Japanese. 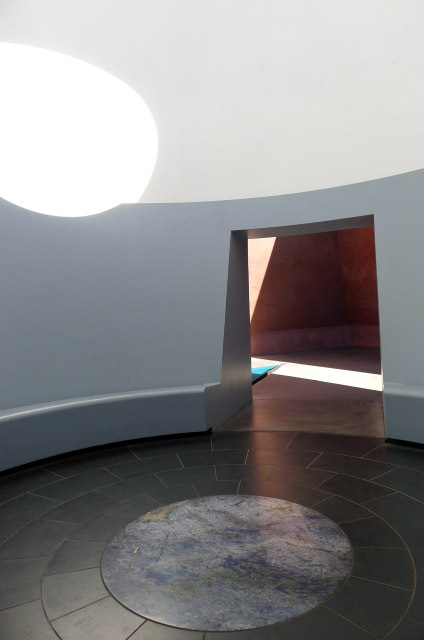 To be honest, I have never heard of James Turrell until I started compiling my daily itinerary for Naoshima Art Island and Kanazawa for my forthcoming trip to Japan. 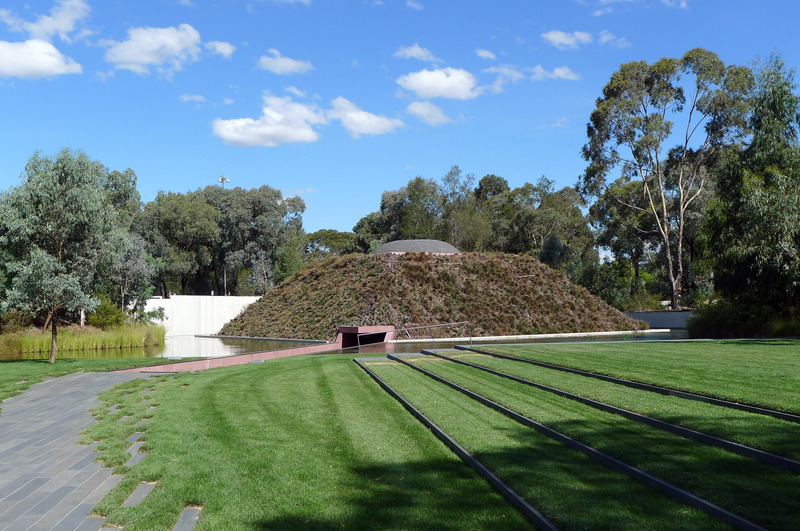 The National Gallery of Australia, Canberra’s Within Without 2010 is part of a series of Skyspace art installations that James Turrell is doing across the world. Personally, I find his idea of ‘Light as Art’ sitting a fine line between intuitively-sensitive people and time-sensitive people – since there is a time element involved to slow down in order to pontificate. What is ‘Skyspace’? 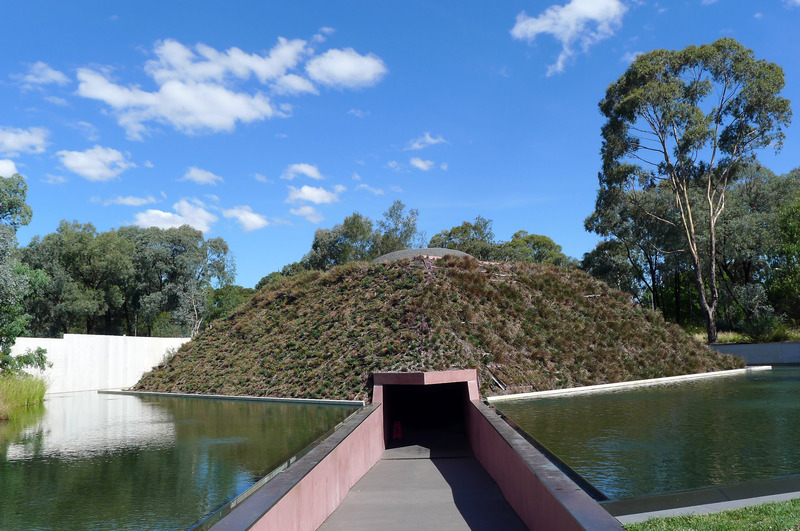 ‘Skyspace is a viewing chamber that effects the way we perceive the sky’, it is a piece of on-site art that we enter via the footbridge into a sunken square pyramid (ie grass mound) surrounded by water. 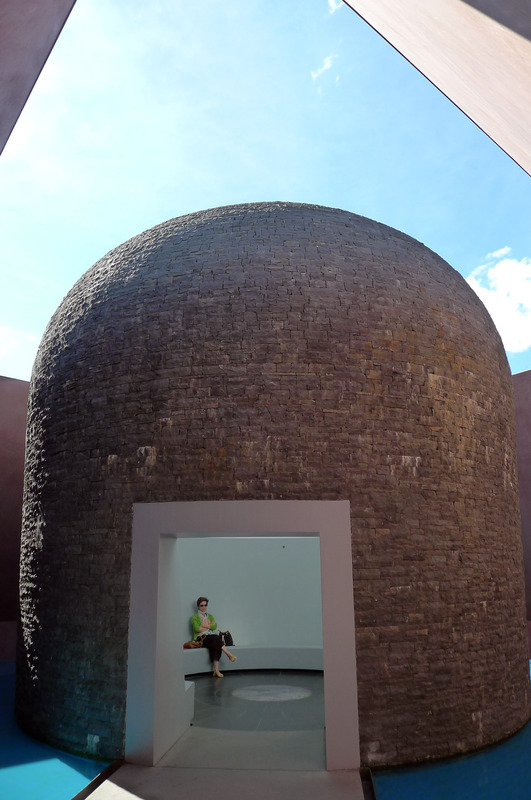 There is a stupa inside where we take a seat, look up towards the sky and ponder or ‘meditate’. The colours were ethereal – turquoise water, terracotta-pink walls contrasting with the white-washed interior in the chamber inside the stupa. It’s also rather cooling inside. Walk into the stupa via the bridge and take a seat. What to look for? The contrast between the artificial light within the installation and the changing external atmosphere affecting the appearance of the sky. Watch for the changes in colour – dawn and dusk are said to be dramatic. Sit, be patient and try to notice subtleties. It’s an experience and takes time. I find this remark of James Turrell very cute, whereby he was alluding the the slow-food movement that is very trendy right now to perhaps start a slow-art movement too!! 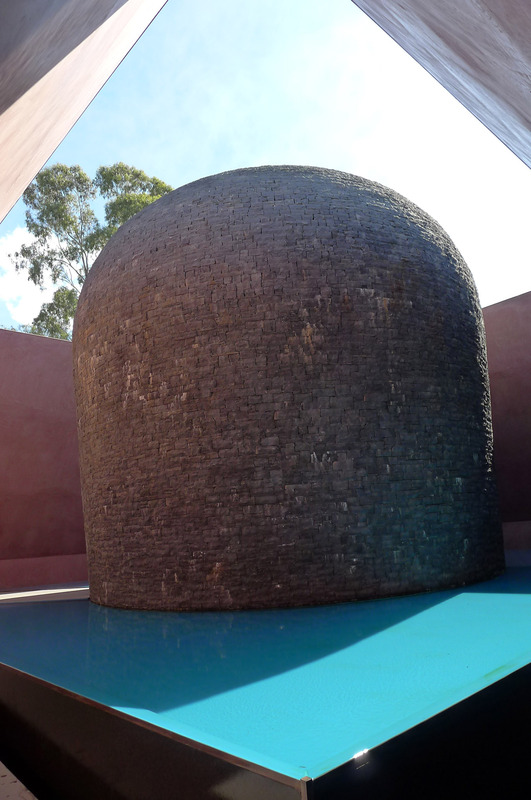 Back of Stupa – note the colours! Needless to say, I am looking forward to see the art collaboration between an American cowboy and a Japanese ex-boxer (Tadao Ando) in Naoshima and how the cowboy manipulates light and colour in Kanazawa! 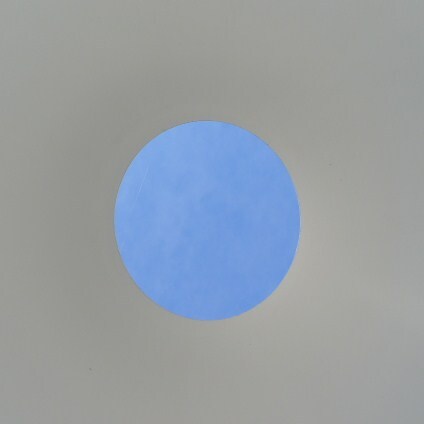 And for those of you who are interested in more of James Turrell’s works, please do check out Artsy’s James Turrell page which has his biography, over 50 of his works, exclusive articles, as well as an up-to-date exhibition listings.